For Burning Man this year, I decided to roam into the land of EL Wire and Arduino and do some animation in the world of programmable hardware. This turned out to be a lot more challenging than I first imagined. While the coding was fairly simple, the hardware I’d chosen had a number of issues including things like lighting all of the EL Wire at once would smoke some of the components on the board. So I spent a lot of time programming interrupt-driven PWM (Pulse Width Modulation Code) This also allowed me to control the effective brightness of the lines but flickering the various EL Strands on and off very quickly. As usual, I took no photos of the finished product when I was at Burning Man and… It takes a bit of work to assemble. So I’ll show the prototype here in a couple of pieces. 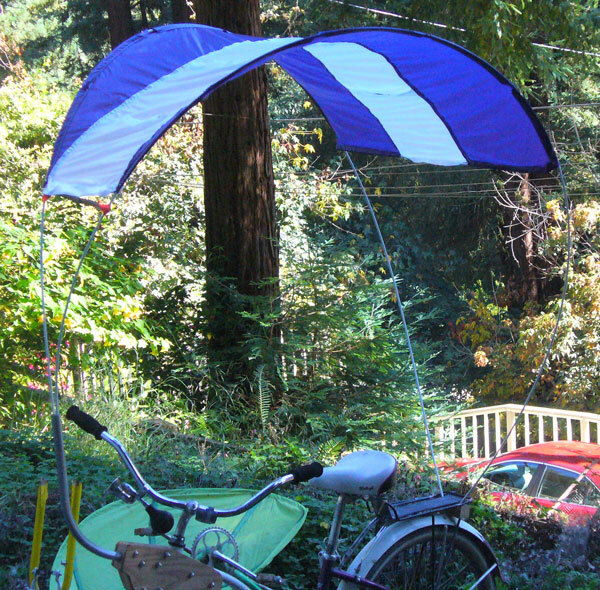 First, the bike canopy itself The white center stripe is stitched with open overlapping ‘scales’ so that wind coming from the front will pass through them with less resistance and wind coming from behind closes them and works like a sail. In this demo, the code is just passing a greyscale fractal image through the 8 channels. Because I spent so much time working around the hardware limitations, I didn’t get to do the animation I was planning. Now that I understand the hardware better, I’m going to try designing a new board that can control more strands and will either not require or will offload the PWM handling so it will be a little while before I come back to the animation. The actual animation for the EL Array will ultimately be controlled by manipulating symbols in a Flash timeline. These then export the data to a compressed file format which will be stored on an SD card and loaded into the bicycle’s onboard computer. Lots of neat stuff left to do on this project but I’m going to detour from it for a short time to work on another project in order to gain the experience required to finish the hardware redesign for this one. You are currently browsing the Obscure Star Studio blog archives for September, 2011.